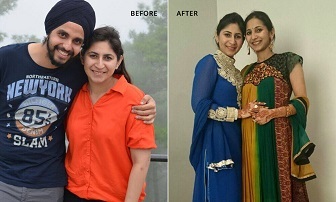 How To Lose Weight (10kg) & Be Happier: A Happy Weight loss journey! Baani Kaur was this typical architect girl with erratic work nature that made her shuttle between Guwahati-Delhi-Ludhiana and an even more erratic sleeping pattern. My meeting with her at one of my seminars is what she describes as ‘life changing’. It’s about the joy that comes from the fact that you no longer experience severe ‘menstrual cramps’ that you had sub consciously accepted & feared every month. It’s about taking immense pride that you are taking to exercise more than willingly when even the thought of it made you feel lazy & drained out. It’s about having the wisdom to be able to fearlessly nurture your appetite when you see the world around you going out of the way to suppress theirs. And finally its about being aware that its not the number on the weighing scale or the size of the LBD that changes one’s life but it takes much more than that to call meeting someone as ‘life changing’. The Ganpati festival has begun and as we prepare to welcome home the God of good luck, the WhatsApp and Facebook timelines of all Mumbaikars get filled with adverts of ‘sugar free’, ‘low fat’, and ‘zero cholesterol’ modaks. The first reference to this traditional sweet made of rice dumplings filled with a coconut and jaggery mixture and sealed with ghee is found in the Padma Purana that dates as far back as 4th century AD. Sage Patanjali (the sage behind Yoga Sutras) would had never thought that thousands of years later, biscuits and noodles would be sold in his name. Similarly, Ganpati while winning the modak from his mother Parvati, would have never guessed that his favourite delicacy, years later, would be transformed into various versions of the low sugar/ low fat variety by the weight loss industry, looking out for people ready to consume products in the name of health or weight loss. But as they say, the truth has a way of catching up, and rightly so, now the Modern Science is also in sync with the age old Padma Purana. In their 2015-2020 dietary guidelines, they recommend that we must eat traditional foods that are also a part of our culture. I am diabetic. 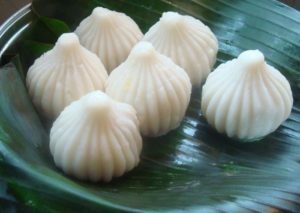 Can I really eat the modak? What’s really wrong with the sugar-free variety? Ok, I give you that you only know about the sweeteners through TV commercials with celebs swearing by them but if you are taking them in place of sugar; then you better know that the American Heart Association (AHA) and American Diabetes Association (ADA) discourages the mindless use of sweeteners in place of sugar for weight loss or even diabetes. The rice flour in modak boasts of an essential amino acid called lysine, that accelerates fat burning. Ghee is rich in butyric acid, a short chain fatty acid, that not only promotes a healthy gut environment but is also fat burning in nature! My doctor has put me on cholesterol lowering drugs. What do I do? If you are worried about coconut and ghee and hence cholesterol, know that in April 2015, the USFDA said that “cholesterol is not a nutrient of concern for overconsumption”. Basically, they believe that dietary guidelines were pointing in the wrong direction and cholesterol and fat is now making a huge comeback. Come on, after all, I am on a diet!